Powerhouse performer and with a voice you'll immediately recognise. Superstar of the session music scene and back-up singer to scores of iconic artists like Luther Vandross and The Rolling Stones, Lisa Fischer took centre stage when her 1991 single 'How Can I Ease the Pain' won her the Grammy for Best Female RnB Performance. Her dynamic vocal range, dulcet-toned intonation and technical skill make her the consummate vocalist and mean she's as in demand as ever. Lisa is an old hand at putting on a powerhouse of a show; she's captivating whether clearing the cobwebs from the rafters with her virtuosic belting, or inviting the audience in with a subdued and haunting melody. Together with an array of talented musicians she puts her own spin on classics from a diverse range of genres and eras. From her own smooth solo soul material to the riff-laden anthems of Led Zeppelin, this siren can do it all. Sound good to you? 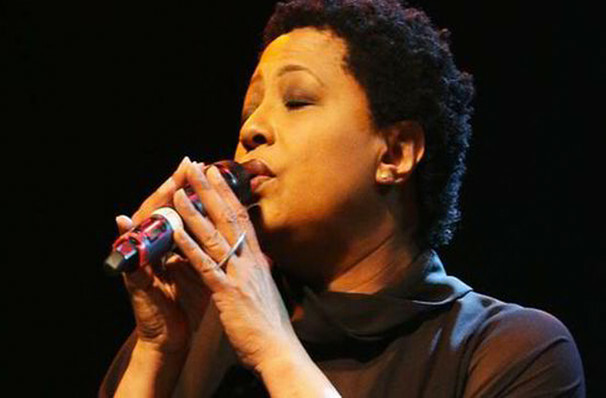 Share this page on social media and let your friends know about Lisa Fischer at Infinity Music Hall & Bistro. Please note: The term Infinity Music Hall & Bistro and/or Lisa Fischer as well as all associated graphics, logos, and/or other trademarks, tradenames or copyrights are the property of the Infinity Music Hall & Bistro and/or Lisa Fischer and are used herein for factual descriptive purposes only. We are in no way associated with or authorized by the Infinity Music Hall & Bistro and/or Lisa Fischer and neither that entity nor any of its affiliates have licensed or endorsed us to sell tickets, goods and or services in conjunction with their events.